After five posts describing our Programs here in Ecuador, I figured our immense number of readers would want a break and want to hear about our first group retreat. On the first weekend of October, we traveled to the town of Baños, a spa city nestled on the edge of the highlands that run through the middle of Ecuador and the Amazon jungle that spreads to the East. After finishing up Saturday classes, everyone hurried home to do some last minute packing. 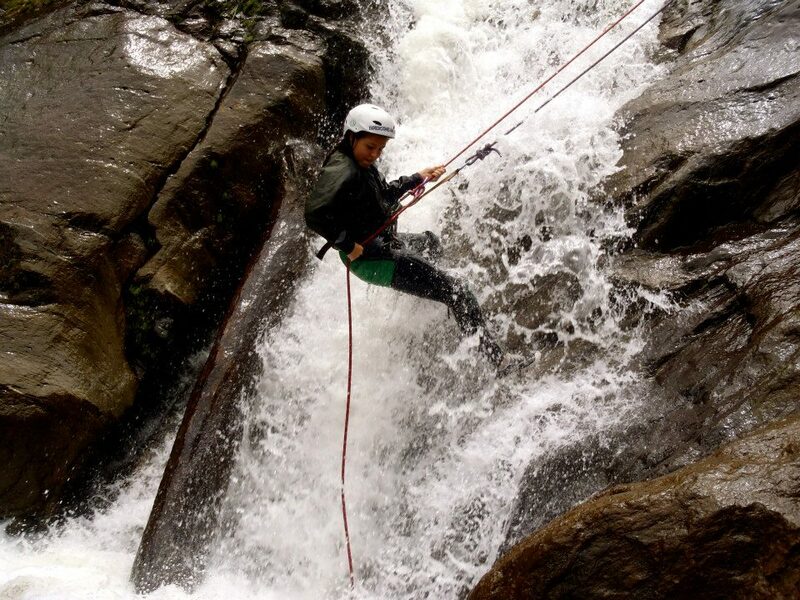 Baños is a perfect weekend destination for us because there are tons of different activities and its only a quick three hour bus trip away. Madeleine, our wonderful social chair, found us a great backpackers hostel close to the center of town that was crowded with interesting travelers throughout the day. It was called Hostel Princessa Maria if you ever wind up there and are in need of a place to stay. After a quick meeting to learn the rules of the hostel, we all got fancy and headed out to our first of many delicious meals we had there. While Baños is known for its cascading waterfalls, sprawling mountains, and challenging hikes, we all came away being most impressed by the quality restaurants that are sprinkled throughout the tiny town. After dinner, we headed out first our first and only night out bouncing around to a couple of different bars that line the three block long bourbon street-esque main drag. Again, if you find yourself there, try to check out Leprechaun Bar. They love giving free drinks to gringos and you can sip them around the bonfire they keep burning in the middle of the bar. After a fun and eventful night, we were excited to tackle our activities the next day. We split into two groups so as a whole we got a good idea of what Baños has to offer. My group of Peter, Joey, Jenny, Madeleine, Janine, Heather and I all rented bikes and went down the path that goes past all four waterfalls. I was under the impression it was off road a lot of the time, riding through jungle paths, barely missing jaguars and swiping snakes from your face. Turns out it was all on the road but that really was the only disappointment. It was essentially downhill the entire time, winding down through mountains that looked like the were the background for scenes from Jurassic Park or Lost. There were so many scenic stops for waterfalls and beautiful views that we had to keep flying past some in order to make good time. Some of my favorite parts was when the road split into a tunnel and separate bike path for bikes only that ran along the edge of the valley we were following and afforded some of the best sights of the day. About halfway through it began to rain but that didn't dampen any of our spirits as we were having a blast. 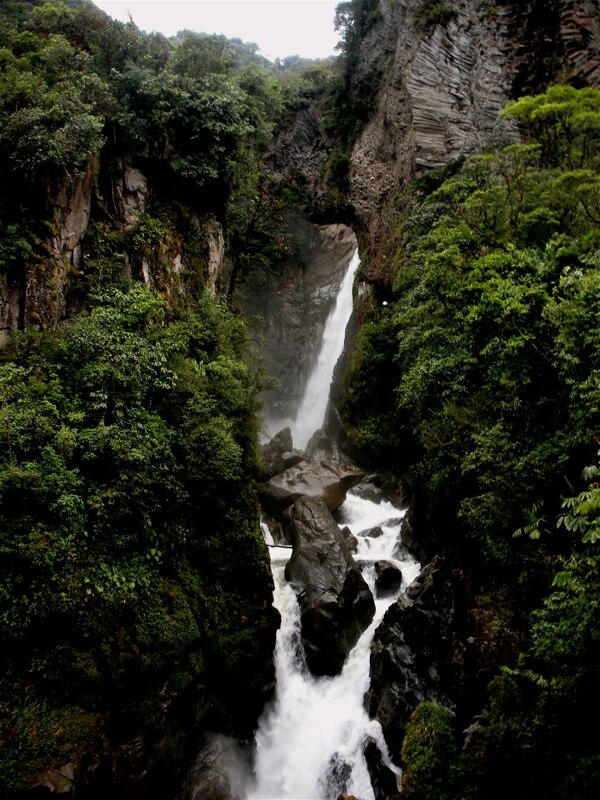 We ended the ride by stopping a popular hike down to the Pailon del Diablo (Devil's Cauldron). As one would expect from the name, it was massive, powerful waterfall that you could literally crawl through the side of the mountain to get to its source. The pictures will succeed where my words fail. 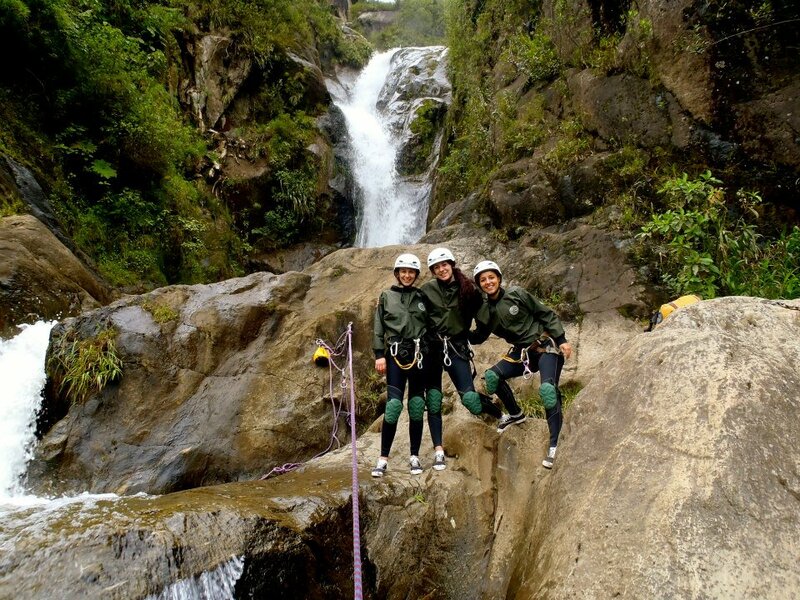 The other group of Polly, Sarah, and Lucy went canyoning, which is one of the more popular activities to do in Baños. It is essentially rappelling down waterfalls. From what I hear, they got just as wet as we did but had more fun doing it. Again, I'll let their pictures speak for themselves since I wasn't there. 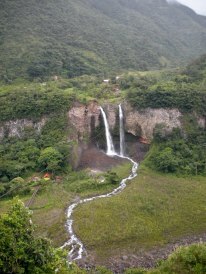 After a round of massages for some of the girls, we all met up in the hot natural springs that gives Baños its name. 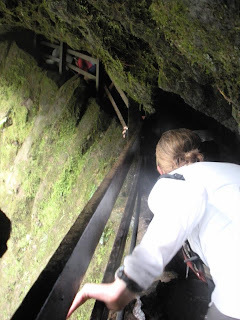 We went at six, right after they were all cleaned, but also right when everyone else - tourists and locals alike - visits. It was an interesting experience to tell people we did, but all in all, the water was too hot and the baths too crowded. After a quick shower, we had our last amazing dinner and then ended the weekend with a group discussion on development a lively/competitive round Ecuadorian jeopardy.